No one enjoys admitting they messed up. No one wants to say, “Hey! I was wrong! I blundered there!” Admitting a mistake is a hard thing. Not even children really like to admit wrong-doing. It can be hard for most of them. Just like adults, children have different personalities. I have a couple of children who are pretty stubborn about admitting fault. I have one who is very quick and easy to apologize. I have one who is okay with apologizing but feels a tremendous amount of guilt over it. But even the ones who are pretty okay with apologizing don’t love it. Apologizing requires humility and it requires realizing you will still be loved even when you admit wrong-doing. At our house, we require an apology, asking of forgiveness, and reparations when an act was intentional. We might also have a consequence of some sort if it is warranted. For example, if a child hit another, an apology would be required, along with asking for forgiveness, and also some time alone to chill out and get ready to be nice to others again. What about when something was an accident? As parents, we can be unsure how to react when something was an accident. If our child slides down an enclosed twisty slide and knocks a child over sitting at the bottom, we might tell our child to say sorry, but then not push it if our child refuses. It was just an accident, after all. Our child didn’t know the other child was there. The other child shouldn’t have even been hanging out there! Accidents happen all throughout life. Sometimes we knock someone’s block tower over because we were walking backwards and didn’t notice it there. That is a simple example from childhood, but all throughout life, honest accidents happen. Car accidents when someone didn’t see the other car or the weather was bad. A child hits a baseball that goes through a window. We forget to show up for something we committed to. We humans mess up a lot in innocent ways. We aren’t even talking about the times we lose a temper or are unkind intentionally. These are just the total accident examples. Who is responsible for those accidents? Who should pay for them, clean them up, make them right? When something was an accident, our knee-jerk is to say, “It isn’t my fault! It was an accident!” and want no part in the responsibility for it. If it isn’t YOUR fault when you mess up, whose fault is it? If you accidentally run into someone, who should pay? Because someone has to pay to fix the damaged vehicle. If you didn’t mean to hit someone, does that mean the driver you hit should pay for your mistake? They didn’t mean to get hit, and didn’t cause the hitting, so does that make sense at all? Should someone across town pay for the accident? No? Then who? It is easy to see in this example that even if you didn’t intend to hit someone, and even if you weren’t being negligent, you still did the damage and you should still pay. The same is true for your child and the innocent mistakes. If your child accidentally steps on another child’s foot (or your foot–which is constant, am I right? ), he should apologize for doing so. “I am sorry I stepped on you!” Simple. Not easy to do. It is hard to admit wrong-doing. But being able to admit fault is an important skill to be learned. To teach our children to accept responsibility for actions. To teach that actions have consequences even if unintended. To teach my children to learn to admit when they are wrong. To teach empathy in the offended. To relieve the offended from holding a grudge. There is a difference in how you apologize when you did something by accident and when you didn’t something out of malice. I have talked about this in I’m Sorry vs. Forgive Me. An interesting thing is that there is benefit to the offended person with apologies, also, not just the offender. 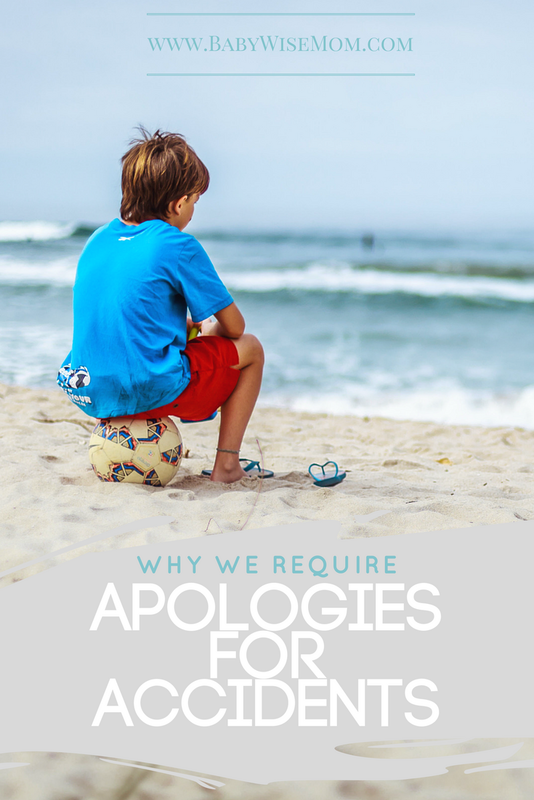 So when you require apologies in your home for even little accidents, you teach your children to accept responsibility but you also help your children grow their ability to have empathy toward others. What an awesome lesson. Teach your children to apologize even when they didn’t mean to do something. It won’t be a one-time teaching. 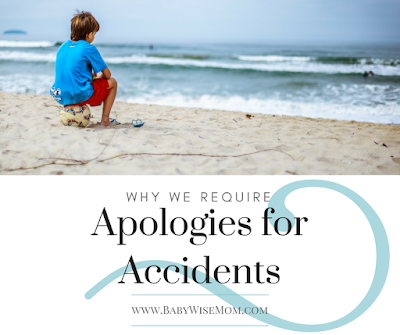 We still have to remind all of our children that we apologize even when something was an accident. Why Bother to Forgive Others?